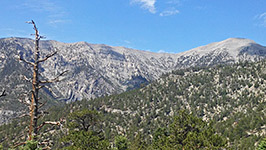 Trail Canyon provides a route for the main hiking path into the upper reaches of the Spring Mountains near Mount Charleston, starting near the far end of Kyle Canyon Road (Hwy 167). 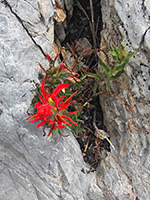 Unlike nearby Fletcher Canyon, which becomes narrow and enclosed, and is partially blocked by chokestones, Trail Canyon is wide, wooded and contains no obstacles, so the 2 mile path, although steep, especially towards the upper end, is relatively easy. 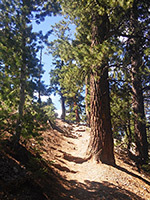 The path leads to a saddle near the north end of Coxcomb Ridge, where it joins the North Loop Trail, which heads east to an alternative trailhead along Deer Creek Road, and west towards Charleston Peak. For most people though, the saddle is the hiking destination; although partially forested, the views are still impressive. Options for shorter continuation hikes include Mummy Spring, 1.7 miles east partly along a spur trail, Cave Spring half a mile west, or the summit of the ridge, 0.6 miles south via an unofficial path. 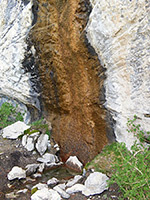 The recently relocated trailhead for Trail Canyon is at the junction of Echo Way with the gravel road to Mary Jane Falls Canyon, near the end of Kyle Canyon Road (Hwy 157); previously the hike began 600 feet further along Echo Canyon Road, at an intersection with a gravel track that leads to a municipal water tank. The trail leads through a corridor of woodland for a short distance, between the Trail Canyon streambed and Echo Way, then joins the gravel track to the water tank. The tank is soon passed, on the right, and a wide trail continues, staying close to the creek bed as it starts to gain height more steeply. 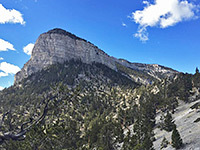 Both sides of the valley floor are covered by tall pines so the views are limited, though the sheer cliffs lining Coxcomb Ridge can be glimpsed to the east, between gaps in the trees. The path crosses to the west side of the drainage and the surroundings remain similarly forested until after 1.5 miles, where it moves back to the east and climbs via several switchbacks, above the forested streamway over more open slopes, ending with a straight section, up to the saddle, near the north end of the ridge. The partial views here are of wooded peaks and slopes in most directions, and down across the low desert to the east. At the junction, the uphill section of the North Loop Trail is the most used branch; the downhill (east) part of this route is narrower, skirting sheer cliffs at the edge of Mummy Mountain then dropping down towards Deer Creek Road.